1/Al-Fatiha-1: In the name of Allah, the Most Beneficent, the Most Merciful. 1/Al-Fatiha-2: Praise is (due) to Allah, Lord of the worlds. 1/Al-Fatiha-4: The Owner of the Day of Religion. 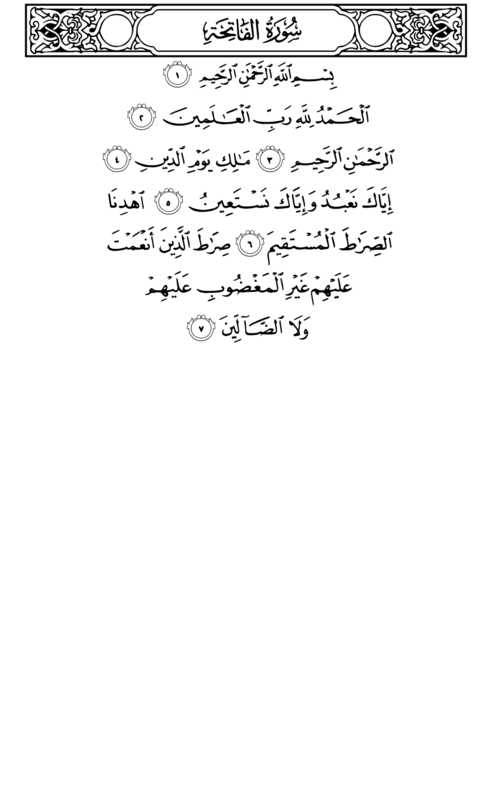 1/Al-Fatiha-5: (Our Lord!) We only become a servant to You and we only ask for help (religious guide) from you. 1/Al-Fatiha-6: (With this help of Yours) deliver us to Sıratı Mustakîm (the path that delivers to Allah). 1/Al-Fatiha-7: That (Sıratı Mustakîm) is the path of those upon (their heads)whom You have bestowed a blessing (the Spirit of the Imam of the time), not of those who have evoked the anger or of those who are in Misguidance (those who do not wish to reach Allah before death).